I hope the holiday season treats you well, and that you get plenty of presents, great food, and quality time with family and friends. I know this income report is a little late. You might have noticed that the latest podcast episode came out a day later than usual too. First off, last week was just nuts. I didn’t sleep anywhere near as much as I should have (four to five hours most nights), and I also logged about 26 hours as a theatre technician between last Thursday and this Sunday (never mind my usual writing assignments and music student load). Secondly, my crazy schedule didn’t exactly help me get this week off to a glowing start. I couldn’t think clearly, I was starting to make stupid mistakes, and yesterday, I had to take the day off to recoup from a stress, food, and most likely weather-induced migraine. Never fun. But it was worth taking that time for myself, and even though I still feel a bit tired, I am well enough to get some work done (plus, I really need to). I’m beginning to give some thought as to how to streamline my work life in 2016, and though I am not debt free yet, it is looking like it could finally come to fruition right around tax time. That will certainly help with getting focused and cutting the fat off of my schedule. I’m also planning for two to three weeks off in July. Summertime is my favorite, and also tends to be the slowest season for business (though not a bad time to put in the extra work to get ahead). I’ve come to realize the importance of taking time to think strategically and have a clear vision for what I want to achieve. I really need this, and hope to open up a few days this holiday season to reflect and prepare for 2016. But if I don’t get around to as much journaling, reading and thinking as I would like, it may have to wait until my summer break. I also need to rest more. I’m bad at this, but I clearly pushed myself passed (beyond?) my limits last week, and while I do need to stay focused on the bigger goal of debt freedom, I no longer want to do this at the expense of relationships, health, or my own well-being. And that trickles into my relationship (love) life, which has been lacking. It’s time for me to put myself out there a little more, as scary as that is. I’m likely going to be taking advantage of dating services in the near future. But that’s probably enough about me. 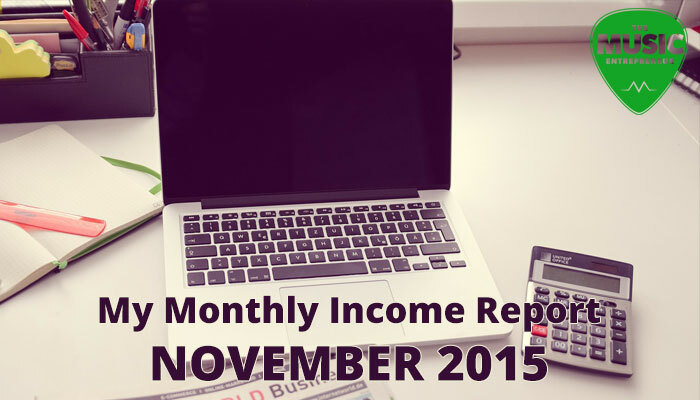 Here’s my November 2015 monthly income report for your perusal. As always, you’ll want to go back to my first ever income report to make sense of these numbers (look at the section titled What You Need To Know About My Income Breakdown). I finally have income to show from my new eBook. I had actually assumed that I wasn’t going to get a cheque until I made $100 US, but this wasn’t the case. The threshold was set to $50 US. The actual cheque I received from BookBaby was $53.79 US, but I had a generous donation from a friend who attended the book launch party too, so combined with the exchange rate and the donation added in, you get the numbers you see below. Other than that, this is pretty standard stuff – no unusual sources of income, and no over-the-top earning records from November. You’ll notice that my spending has increased somewhat. First of all, this is because I decided to move DAWCast.com off of Bluehost. Out of all of the sites I own, it’s the largest, and was clearly the culprit for most ongoing data and server load issues. The transition over to DreamHost was easy and painless – more so than any other hosting company I’ve worked with in the past. I’m thinking about promoting DreamHost over Bluehost (as an affiliate), but I need to get to know their service a little better before I do that. Secondly, I’m also taking some chances. There are some low-cost subscription services (like HitTail) that I’ve been thinking about taking advantage of all along, but because I’m also looking to take my website revenue to the next level, I’m experimenting with different marketing methods and services to help me achieve this end. In general, I’m finding that blogging has been producing some of the greatest return on investment, so it only make sense to put more time into keyword research via tools like HitTail. Anyway, let’s get to those expenses. I’ve been giving a lot of thought to the revenue models I want to peruse in 2016. I’m seeing quite a bit of traction with blogging as a marketing tool, and my new eBook is the best selling music-related product I’ve produced to date. I spent a lot of time figuring out my branding in the last year or so, and I feel that people are connecting well with The Music Entrepreneur. Now it’s a matter of taking what works and running with it. Books & courses: I’ve been thinking about how I can make the most of my new eBook, and I’ve come up with at least six new product ideas. First on the list is physical copies, because many of you have been asking about that, but following that, I intend to create a workbook as well as two audio versions of the book (one read by me, another read by a professional voice actor). I’ve also come up with two companion book ideas, but odds are I will only be able to write one more in 2016, if that. As for courses, I still intend to do something with the 101 podcast series I’ve been doing. Membership content: it’s come to the point where I have a lot of eBooks, guides, tools and courses (just check out the resources page). I have been thinking about simplifying my offerings, and instead of supporting many different products, creating a paid membership program where you can access individual courses and bonus content. Of course, anything that’s free will remain that way. Personal coaching/consulting: I’ve actually been offering this for a long time, but it has mostly been on an ad-hoc, pro bono, or promotional basis. It’s time I created a dedicated page where you can learn about my personal coaching. Affiliate earnings: truth be told, I’ve earned very little or nothing at all from affiliate commissions. But I am well aware that I can do a much better job of this, and I intend to moving forward. I also hope to be able to show you my thought process behind these decisions, and what it will require of me to make it work. More on that later. And if you enjoyed this, you can also check out last month’s income report.